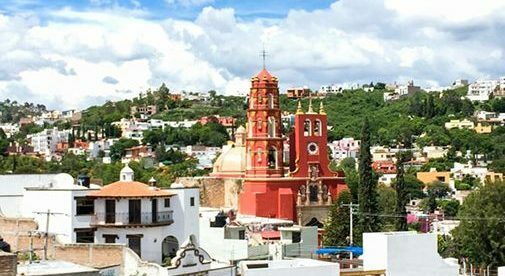 Louisa can easily work remotely from the low-cost and vibrant city of Guanajuato. In an email, my U.S. client wrote, “Hope you’re enjoying your vacation.” I had to smile. Even though my husband, Barry, and I have been living in the UNESCO World Heritage city of Guanajuato, Mexico part-time for more than 12 years, many of my friends and contacts still think we’re on vacation. It’s not vacation…it’s our everyday life. But it’s a rich and rewarding life. I’m not alone in experiencing it this way. Most of the expats I know in Guanajuato have come here to escape the tyranny of a nine-to-five, but they’re still active and involved in the community. Some expats own homes, some rent, and others housesit. Many, like us, started off renting, but kept coming back and eventually bought a home. Because many homes are on callejones (pedestrian streets) most people don’t own a car. And why would they? You can hire a cab for only $3, but it’s actually simpler and more pleasurable to do errands on foot, because the streets are so colorful and lively, filled with artists, students, musicians, and vendors. The street life is what draws so many expats to Guanajuato. It’s hard to imagine if you’ve grown up in the U.S.—where streets are often thought of as dangerous—but in vibrant Guanajuato, expats and locals alike spend much of their day outside, whether sitting in one of the many squares, listening to a performance of musicians on the steps of Teatro Juarez, or lingering over a coffee on a café patio. If you’re doing errands, you’re likely to run into someone you know and end up having a chat, because the city is not very large. Many of the festivals that take place in the city are also outside, such as the Guanajuato International Film Festival, where viewers watch short films while sitting on the classical open-air stairs of the university, or the Madonnari festival, where artists from all over the country create detailed, elaborate drawings with chalk on the streets and sidewalks. The city offers a delicious contrast of colonial and modern architecture: Wandering along some of the city’s labyrinthine callejones, I feel as though I’m in an ancient North African souq marketplace, yet, back at my home, I have the conveniences of a solar heated shower and fiber-optic WiFi. Like some other expats, Barry and I still work part-time. A science writer, he writes seven columns a month. I’m a business trainer and coach. I lead trainings in the U.S., but plan and develop materials in Mexico. I also provide business coaching over Skype. In Guanajuato, you’ll find expats earning in different ways. Some work remotely for their employer in the U.S, others are self-employed as artists, writers, or consultants, while many create supplementary income by renting their home on Airbnb or VRBO (Vacation Rental by Owner) when not in town. Many expats also get involved in local nonprofits: Some volunteer at the English-language library or coach students in English, while I lead a writer’s group for seniors. Some continue working on Spanish, taking classes at one of the language schools in town, hiring a tutor, or participating in intercambios (language exchanges), where English and Spanish learners share their language skills. Others take drawing, painting, and printmaking classes. There’s also a crafts group and an open mic for writers. As for vacation, even living in Guanajuato we still enjoy taking breaks away. We go to the beach for a week, to Mexico City, or to one of the many Pueblos Magicos (magical towns) that dot the country. Life in Guanajuato isn’t a vacation…it’s much more: stimulating, colorful, and endlessly rewarding.